Until the mid-20th century, Roosevelt Island in the East River between Manhattan and Queens was known as Welfare Island—a site for hospitals, penitentiaries, and asylums. In the 1970’s, the island was developed as a residential community and is now home to 14,000 people. In 2005, The Trust for Public Land finalized a master plan for developing a long vacant site at the southern end of the island—transforming it into a 7-acre park with expansive lawns, gardens, and spectacular waterfront views. 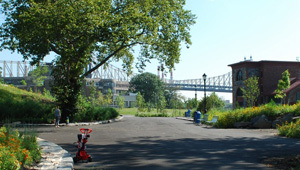 Following the master plan, we assisted the Roosevelt Island Operating Corporation in raising $13 million to design and build the new park. This included stabilizing architect James Renwick's Smallpox Hospital, the city's only landmarked ruin. On August 2, 2011, The Trust for Public Land joined city and state officials to cut the ribbon on this new park. In Fall 2012, the FDR Four Freedoms Park, designed by the great 20th century architect Louis Kahn, will open on an adjacent site.